I could say a lot about this rich world – but I’ve said that in other books. I could mention the fun plot – which is fun and swashbuckling – but I’m going to need all my space to talk about the characterisation of this book which was what really shone out. I really like the evolution of Gareth in this book. Gareth is an interesting combination of self-loathing and arrogance. Steeped in human culture, he has come to hate everything vampiric, including himself. He hates the clans, he hates his species, he hates everything they do. He sees no value in their culture, their society – anything. He sees his species as not only doomed to extinction, but possibly even deserving of it. Then we have Yidak who is even more unique – because he is a vampire through and through a vampire who is progressing and advancing through more than imitating human ways. I think the most powerful example is his “written” language. We see Gareth over and over trying to use human writing despite the difficulty of using a pen considering vampires’ limited manual dexterity – then we see Yidak developing a language based on sound (to fit their oral tradition) and with a writing system better suited to vampiric strength and claws. 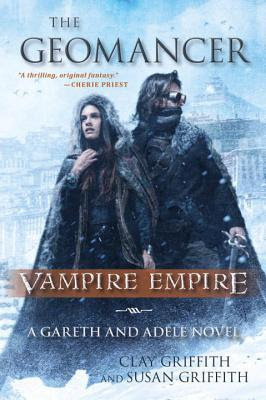 Interestingly it’s Adele who continually pressures Gareth to see the value of his own culture, to see vampires capable of achieving more beyond himself, who continually pushes Gareth to see beyond himself. It’s an interesting dynamic because, of course, Adele has already adapted to see vampires as something more than monsters by seeing Gareth as a person. There’s a lot of excellent racial diversity in the Equatorian Empire – in the world building the northern powers fled south to warmer climates to avoid the vampires that rose up (vampires hate the heat). It would have been easy to transplant the British Empire to the Equator – but many of the main characters are POC. Adele and her brother are mixed-race, their mother was Persian. Adele’s main confidant, General Mehmet is a POC as is Anhault one of the primary military leaders in the Empire – and the characters use Arabic as a go-to lingua-franca as well as commonly using Hindi and Swahili. The vampire monks they stay with are also largely POC – Tibetan, Chinese and Japanese and it’s they who are leading the way in a new way to be vampires in contrast to the majority of the European clans (while it’s not reduced so simplistically because we still have the King of the Paris clan being very family and child orientated). I wouldn’t say the huge diversity is flawless – I have a couple of issues. Firstly, while there are several people described as speaking various languages and described as various ethnicities but the Equatorian empire seems to have few cultural signifiers. There’s also the excellent conflict between the Technocrats and the Geomancers. Most people in the Empire don’t believe in woo-woo, don’t believe that Adele can do what she can or who has done what she has. It’s an excellent conflict as the Empire is driven by people seeking progress and technology and overlooking both an incredible source of power and dismissing what they consider backwards superstition. It’s a conflict that can tear the empire apart with some very powerful politics. While I like the story, it’s notable that the technocrats largely have English names – and even her own brother who dismisses the woo-woo is described as paler and favouring his English father while Adele, the geomancer looks more like their Persian mother. While in some ways this is more powerful because the geomancy is a source of power – yet at the same time having the POC wield woo-woo while the White characters wield technology is an old trope – thankfully subverted with the evil geomancer they’re all opposing. Sadly, there are also no LGBT people in the series still and no disabled characters. I would also really like it if Adele had some female peers. She’s an awesome character, strong both magically and physically, intelligent, imaginative, brave – I like her a lot. But everyone around her is male. The other powerful women – Flay and Hallow, are definitely team evil. Catarina was interesting but also sadly damselled – though she did show strength and agency, more so than her husband. This book comes with a lot of excellent development that really enrich the series. Gareth’s conflict over what it means to be a vampire and how vampires can develop. In turn this – and the depiction of the King and Queen of Paris, and even the arguments of the enemy Geomancer resisting the Equatorian invasion, bring a greater level of nuance to the whole series. If vampires are more than rampaging monsters, then is the Equatorian war to drive them out of Europe, even wipe them out, as simple as good versus evil? On top of that we can see a lot more conflicts developing within Equatoria itself – geomancer vs technocrat, Adele and her brother and how much authority Adele as the Empress actually has. There are some meaty conflicts here. I had thought that, after the third book, this series was other. I was somewhat concerned that this extra book would be like many I’ve seen – a desperate attempt to drag a trilogy on, like a nice house with a damned ugly extension slapped on the side. I was surprised that it really opened up the series, looked deeper and brought out the potential four many more excellent stories. This book brings new life and potential to what was already an interesting and very unique series – an excellent addition and excellent development.